For more recent articles with updated information on the Syrian Civil War, check out this post or my latest piece on Syria. While it began as a native opposition against its government foreign fighters have come all over the world to fight for both sides in growing numbers and regional and international powers also became involved both directly and indirectly. Today, it is no longer simply one side against the other as within the opposition there are factional battles and internal conflicts. Bashar al-Assad is a Ba’athist politically and religiously a member of the minority Alawite sect, an offshoot of Shi’a Islam. 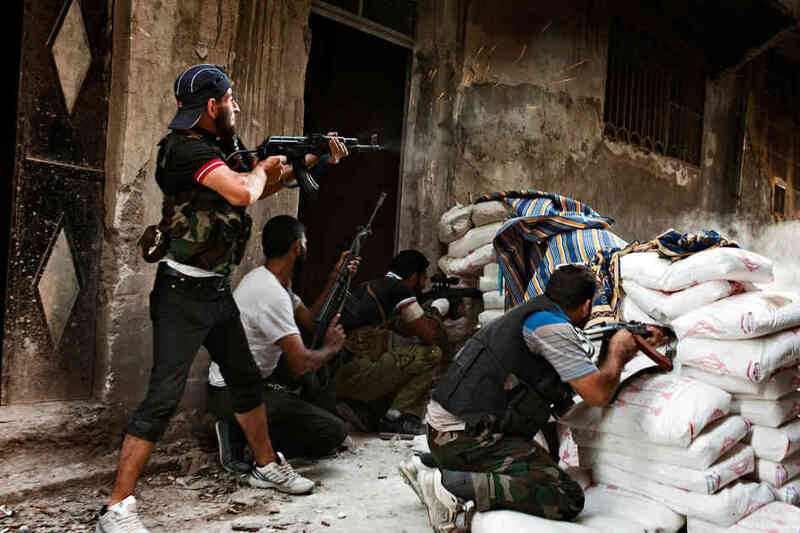 Fighting on his side is the regular Syrian Armed Forces and the less formal pro-regime militia Shabiha. Christians, Alawites and other minority groups have primarily sided with the Syrian state over fears they would be targeted by Islamic militants or be marginalized by the opposition. The Kurds are arguably the largest ethnic group without a state of their own. Kurdish groups officially fight under the Democratic Union Party (PYD) in either Popular Protection Units (YPG) or smaller Kurdish militias. They seek further autonomy and possibly independence within Syria and have strong ties to the Kurdish Autonomous region in northern Iraq. The opposition groups are under the very wide and very loosely organized banner of the Free Syrian Army (FSA). There are numerous militias and smaller groups with a wide range of political and religious affiliations but when discussed in the media, the FSA typically refers to moderate anti-Assad Sunni groups who wish to see Assad deposed. Controversially regarded as the most effective rebel groups are the Islamic State of Iraq and the Levant (ISIL) and the Jabhat al-Nusra Front, both Islamic militant al-Qaida affiliates. They have successfully recruited foreign fighters from dozens of countries around the region and the world and seek to establish a new Syrian state under Islamic law. The United States and other Western powers have sought to support the rebels but increasingly found it difficult because of the influx of hard-line extremists. Other Sunni majority countries such as Saudi Arabia have provided funds and support to a wider variety of rebel groups. Iran and Hezbollah (the Lebanese paramilitary group) have directly and indirectly supported the Assad regime. Hezbollah has sent their own fighters to the battle lines and there is evidence to suggest that Iran has done the same. Russia indirectly supports the Assad regime because of their longstanding alliance and the strategic importance of the only Russian port directly on the Mediterranean Sea, which is located in Latakia. A UN report confirmed that the sarin nerve agent (gas) was used in an attack on the Ghouta suburbs of Damascus on August 21 where over a thousand were killed. While the report does not explicitly assign blame, the substantial evidence and analysis in the report all but condemns Assad and the Armed Forces in name. Russia still maintains that they hold evidence pointing to the rebels as the perpetrators, but outside of Assad and his allies few else believe this after the extensive UN report and investigation. President Obama in August of 2012 stated that the use of chemical weapons would be a “red line”, but recent diplomatic efforts successfully sidestepped a proposed military intervention. 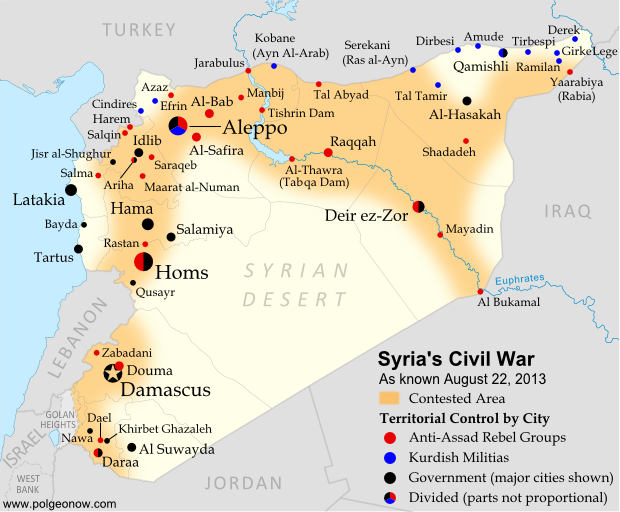 The commonly accepted start date for the Syrian conflict is March 15th, 2011 when youth organized “Day of Rage” popular demonstrations against Bashar al-Assad’s oppressive government sparked additional protests similar to other “Arab Spring” countries such as Tunisia, Egypt and Libya. The Syrian Armed Forces first used deadly force against protesters on March 18th, where five were killed in Daraa. The conflict escalated to being called a civil war in June/July of 2012, when Herve Ladsous, the first senior UN official declared the conflict a civil war in response to Assad’s use of attack helicopters against opposition forces. The Red Cross declared the conflict as a civil war about a month later in July. Where is the fighting taking place? The fighting has split up the country heavily upon sectarian and ethnic lines. Pro-Assad territory is mainly in the Alawite heavy western coastal provinces centered around Latakia, Tartus and Hama but also in the southwest by Damascus. Regime forces have made up ground recently in the south and in the major cities. The Kurdish groups near the Turkish border and the northeast have recently been making overtures towards establishing an independent or autonomous Kurdish region in the northern areas of Raqqa and Hassakeh Provinces and pockets in all directions north of Aleppo. Opposition groups including FSA and ISIL and al-Nusra have a strong presence in Aleppo Province and the eastern areas sans the Kurdish areas to the far north. The majority of the fighting is in the suburbs of Damascus and Homs between rebels and regime forces, though the opposition has been gaining in the north near the Alawite region. Major changes in the above photo since August 22 include the rebel takeover of Azaz in the northwest and increased clashes in Hassakeh in the northeast. Assad and his allies have since the beginning claimed that they were fighting against foreign terrorists and foreign agents seeking to subvert the legitimate authority of the state. While at the onset of the war this was patently false, as the war has continued foreign fighters have played more and more of a crucial role. ISIL and al-Nusra wish to create an Islamic state governed under Sharia law. Recently al-Nusra and many other groups rejected authority of the newly selected FSA leadership because of their goal of a democratic state. The Kurdish groups as mentioned earlier seek regional autonomy or their own independent state. The FSA and associated moderate rebel groups want Assad out of power and a new democratic, secular, civil government to take his place. Having Assad out of power is perhaps the most important factor that the rebels will not let up on while Assad refuses to step down. Perhaps the most destabilizing force of all is the infighting that has intermittently occurred between opposition groups. ISIL and al-Nusra have fought Kurdish militias, FSA groups and against each other at one point or another. A unified opposition has become less feasible as the fighting has worn on due to the complexity of the groups involved. The result has been a war that at least from the situation on the battle lines seems to have no end in sight.